I worked very hard to bring a Math product that is fun for the students but challenging and rigorous enough to enhance the students’ Math skills during the “tough time to teach” holiday season. Use this for individual practice or in groups of two. Each item or gift page comes with a code key to match the answers to the letter. Then the kids have to unscramble the letters to decode the Christmas toy or gift. Pass out one each day before Christmas break, or pass out the entire packet to work on at their own pace, or any other way you choose. This packet comes with a “Pizza Order of Operations” student reference page, too, which is a fun way for students and teachers to learn and teach the order. When I used this in my 5th grade class, it took at least 20-40 minutes for each item worksheet depending on the skill level. The entire packet would approximately take between 1 to 2 hours. The words to unscramble are challenging which eliminates or lowers the chance for the student from "knowing the words" before solving all expressions. These rigorous expressions can be taught and used throughout the year, not just for the holiday season. They can also be used for formal or informal graded assessments. The last page is the Mystery Message Decoding Page which includes a fun, holiday message and 2 challenging vocabuary terms but a message that can't be solved by merely using a few letters. 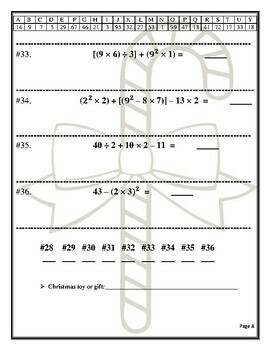 Note: I have another Math Christmas Packet just like this one in my store called Mixed Math with more standards or you can purchase the BUNDLE OF TWO which is cheaper. Fun, Challenging, & Time Fillers for Holiday Season! Note: Every unit or product I create in my store, including this one, has been used or continues to be used by classroom or homeschool teachers. NOTHING in my store has never been used in a real life setting. This allows me to modify, correct, add, and improve my units and products from feedback and personal experience on a continual basis. If you are or become a valued customer, please frequently check back to download the improved version. Thank you so much!